Left to Right: Dr. Nicos Peristianis, President of the Council of the University of Nicosia and Capt Norbert Aschmann, CEO of Bernhard Schulte Shipmanagement. Bernhard Schulte Shipmanagement (BSM) and the University of Nicosia have signed a cooperation agreement granting the University’s Maritime Academy full access to BSM’s state-of-the-art Maritime Training Centre, located at the Limassol Marina. This partnership also represents a significant contribution to Cyprus' ‘Blue Growth’ programme - an initiative aimed at stimulating growth, jobs and competitiveness in the marine and maritime sectors. The Maritime Academy will begin admitting students in September 2016, offering three degree programmes in Marine Science, Marine Engineering and Marine Electrical Engineering. 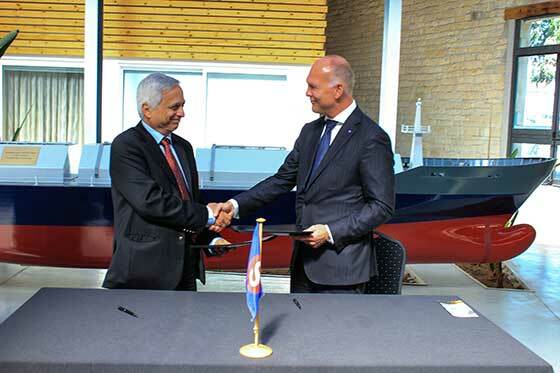 "This agreement enables us to offer specialised degree programmes for merchant marine officers,” explained Dr. Nicos Peristianis, President of the Council of the University of Nicosia. “Aspiring officers now have access to high level education and training, as well as being able to develop their skills in line with technological developments, supporting the essential role they play for the shipping industry." Captain Norbert Aschmann, CEO of BSM added: “BSM has a long and proud tradition in Cyprus and is committed to the development of Cyprus as a major global maritime hub. The opportunity to partner with the University of Nicosia will ensure that our excellent training facilities not only provide career development internally for our own personnel, but also benefit the next generation of seafarers who will undergo their academic training through the Maritime Academy.